In a recent post, I discussed a book on exponential organizations co-authored by Salim Ismail, Global Ambassador for Singularity University. In a Video from this week’s Exponential Finance conference, Mr. Ismail showcased their work on an Exponential Quotient that scores companies on organizational factors that determine how well they are positioned to succeed in an exponential world. This exponential quotient results from a diagnostic survey that asks 21 questions (each graded 1-4) about how companies have structured their products, services, and internal framework. At the end of the diagnostic, an Exponential Quotient score is determined. 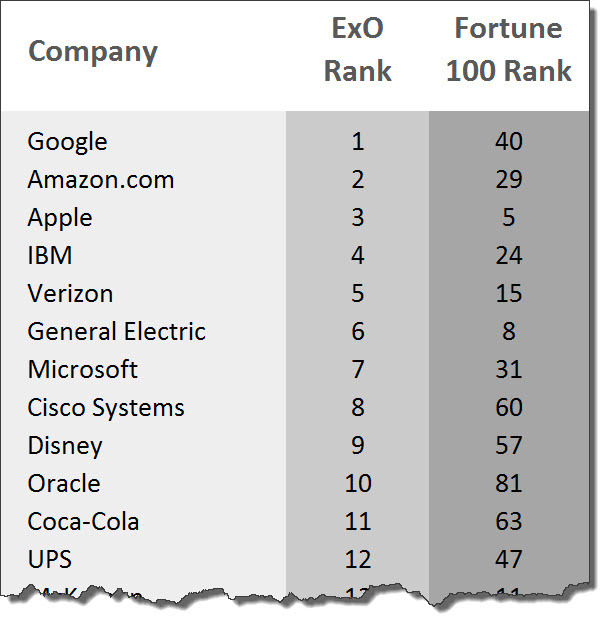 The folks at Singularity University used this quotient to create The ExO Fortune 100 – a re-ranking of the current Fortune 100. The scoring was ratified by academic researchers at Hult Business School. I’ve re-printed a list from their site that shows some of the elements of the survey and the key attributes of ExOs that are being tested. Does it have a Massive, Transformative Purpose, (or MTP)? How externalized are business functions? How much are on-demand staff and on-demand assets utilized? How well are Community and Crowd leveraged? Are algorithms a core part of the organization? How information based are its products and services? How well are interfaces created to manage external scalability? Are OKRs and Lean Metrics used to track performance? How well does the organization encourage risk-taking and experimentation? Does the organization operate top-down, command and control hierarchies, or flat, autonomous, collaborative team structures? How well are social technologies integrated into the organization? As I said in my post on exponential organizations, there remains a single constant: it will take a different type of organization – different than the ones most of us grew up with – to survive the coming shift. The attributes or characteristics that create this different type of organization are getting clearer. It’s up to us to create it.